We are the foremost provider of Formal Shoes. Our presented product is designed by professionals employing the optimum quality material and advanced techniques. 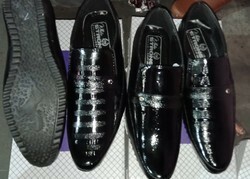 Our clients can avail from us high quality range of Formal Black Shoes. These are available in various sizes and designs.Our products have got a high demand in market due to their superior manufacturing and the comfort they provide to the wearer. This formal ballerina is appropriate for those workaholic and professional women who have a daily affair of attending board room meetings and consortiums. This formal belly for women is extremely classy and sophisticated and you cannot escape the opulence exhibited by this ballerina. - Smart, well-structured formal slip on shoes. We are foremost organization, actively occupied in providing a wide of Black Formal Shoes that meet on customer’s demand. We offer an attractive range of Mens Formal Shoes to our clients. The Mens Formal Shoes are generally worn by men in offices, business meetings, functions, etc. 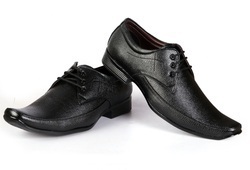 Our Mens Formal Shoes are fabricated with high grade leather and other raw materials. The company is a Manufacturer, Exporter, and Supplier of these Mens Formal Shoes. We are manufacturer, supplier and exporter of a unique range of PU Sole Shoes to our clients. For all working class men, these shoes are a perfect choice. These shoes can withstand wear & tear, are highly durable and require less maintenance. Our clients can ask for these shoes in standard colors, designs and patterns.